Could a UFO sighting not only be frightening but deadly as well? Some researchers into the strange phenomenon think so and hold up Betty Cash’s incredible story as an example. On Dec. 30, 1998, the Mutual UFO Network (MUFON), an organization dedicated to studying UFO and alien sightings, issued a news release about the death of Betty Cash. She had passed away exactly 18 years after her alleged close encounter. "Mrs. Cash was a hero in the fight against government UFO cover-ups and brought hope to other victims of UFO incidents," read the news release. "She was devoted to family and friends and never allowed her illness to prevent her from helping others to cope with the trauma of UFO close encounters." On the evening of Dec. 29, 1980, Cash, friend Vickie Landrum and Vickie’s 7-year-old grandson Colby were driving home to Dayton, Texas after going out for dinner. They were traveling down an isolated two-lane road through some woods. At about 9 p.m., they all saw a light above the trees. At first, they assumed it was coming from an airplane. A few minutes later, they saw what looked to be the same light as before, but it was now much closer and very bright. 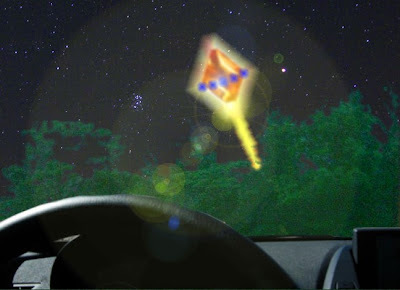 The light supposedly came from a huge, diamond-shaped object, which hovered above the treetops in front of their car. The object was sending out a lot of heat and a bright flame. Vickie Landrum told Cash to stop the car. She was afraid that they would be burned if they got any closer. Cash considered turning the car around, but abandoned this idea because the road was too narrow and she was worried the car would get stuck on the shoulder of the road, according to a Web site. Cash and Landrum got out of the car to get a closer look. The UFO was shaped like a huge upright diamond, with the top and bottom cut off so that they were flat rather than pointed. Small blue lights ringed the center and flames shot out of the bottom. Cash and Landrum later said the heat was strong enough to make the car’s metal body painful to the touch. Cash claimed she had to use her coat to protect her hand from being burnt when she finally got back into the car. When she touched the dashboard, Landrum’s hand left an imprint into the heated vinyl. Little Colby was scared and wanted his grandmother to protect him. The hovering UFO then moved higher into the sky. As it flew over the treetops, Cash and Landrum claimed that a group of military helicopters approached the object and surrounded it in tight formation. Cash started up her car and left the scene. She claimed to see glimpses of the UFO and the helicopters receding into the distance, according to the Web site. That night, Cash, Landrum and her grandson all got sick. They suffered from nausea, vomiting, diarrhea, general weakness, a burning sensation in their eyes and feeling as though they had been sunburned. Over the next few days, Cash’s symptoms got worse when she developed blisters and hair loss. She was taken to the local emergency room for treatment on Jan. 3, 1981. The Landrums fared somewhat better, though both suffered from lingering weakness, skin sores and hair loss. A radiologist who later examined their medical records believed that all three of them suffered radiation poisoning. Starting with the UFO sighting, Cash’s health got worse and worse. She was forced to close her business and never worked again. She spent a great deal of time in the hospital, often in intensive care. "Although they and others observed a large number of military helicopters along with the UFO, the U.S. government refused to acknowledge the event or assist them in any way," read the news release from the MUFON. Cash and Landrum even tried to sue the U.S. government for $20 million, but a U.S. District Court judge dismissed the case. So on the 18th anniversary of the sighting, Betty Cash died at the age of 69. Her health had not been the same since the encounter.